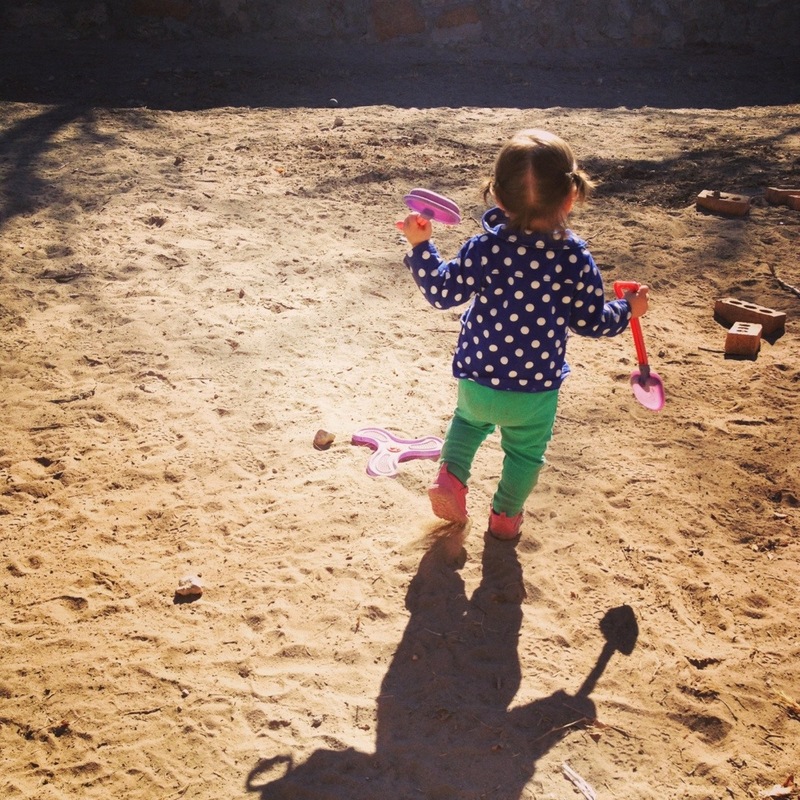 Yesterday Norah wanted to play in the dirt. So, going against my strong dislike for getting dirty, we put shoes on and went outside. I cringe when I see Norah fall over into the dirt, covering her cute leggings and jackets with a dust that just won’t ever come off. I cringe when I see her grab fistfuls of it and dump it over her pigtails. But she wears a smile that is incomparable when she’s outside. And that makes it worth it. I was kind of surprised, though, at her obedience when we were outside. I sat safely away from the dirt on my patio, telling her boundary warnings every so often: don’t play near the dog poop; don’t dump the dog water onto your clothes; no, we don’t eat sticks. Each time, she listened happily and immediately. Why was this happening? I started listening to myself, and realized my words. Each time I asked her to do or not do something, I followed it up with a praise. I mentioned trying to do this more often in a previous post, and it’s something I had done when Micah was learning to obey. My kids, like most people, need feedback. They want to be good at something, and they want to excel. They love showing off what they can do well. They crave that attention from me. When I reinforce what they do well, they’re proud of themselves. I’ve seen the same look of satisfaction on their faces when I praise their obedience as I see when they accomplish something they’ve been working at – opening a jar or figuring out a new toy. She looks at me and touches it again. She looks at me, reaches to touch it, then pauses. I reward every tiny obedient step with praise, even if we have to go through that scenario over and over and over. She learns which actions receive positive feedback, and which ones don’t. She wants the praise, so she works to get it. When she learns how to get it, she likes to show off how well she can do. Sometimes she even takes me to the toaster to say “uh-oh” and gives me a big smile, as though she’s showing me how well she can obey. I’m free with my praise because I don’t want to be free with my discipline. When I show my kids that they can receive positive attention from me by being obedient, they don’t have to strive for my attention through disobedience. It’s not like I’m rewarding them with candy or something, either. The simple acknowledgement and thanks of how well they listened is sufficient. No one likes to be bossed around. Thanking my child for her obedience shows her a mutual respect. It puts her on a person level with me, instead of a one dimensional authority-submission level. She’s much more willing to listen when I’m not just calling out orders. It carries over into how they respond as well. The other day Micah asked me for some milk please, and when I handed it to him, he thanked me for listening to him. When Norah shares a toy with him, he often thanks her for sharing, even when I’m “not around” to hear it. It’s a kindness that is permeating our conversation, and it’s becoming a reward to me as well.